During the past few years, Alabama’s Kirby Smart has seen his stock rise after national titles and prevailing defensive superiority. Smart has enjoyed the spoils of the Crimson Tide’s achievements. He has been rewarded with accolades, a new contract, and with the respect of his peers. Smart is a candidate for most head coaching positions that are available each season. The word is out that the energetic coordinator is someone not to be overlooked. However, for the first time in the Saban era, change is coming to Tuscaloosa. After crushing losses to Oklahoma and Auburn, the Alabama defense has more questions than answers for the first time in years. How will Alabama contain the spread offensive attacks that are becoming more prevalent in the SEC? Was Nussmeier simply a “fall guy” after a season that most Alabama fans consider to be disappointing? Will Smart be the next in line if things do not go well in Tuscaloosa in the upcoming year? The Alabama defense was better on paper this season than it was on the field. This is due, in part, to injuries and inconsistencies in the defensive secondary. When the secondary was struggling, the inability to rush the passer was glaring. Smart will need his defense, despite its attrition, to become a more consistent unit next season. I am not saying the talent is not there to do so. Alabama has a wealth of talent and the young players on the defensive side of the ball could step up and deliver a stellar level of production. But, it would be assumptive of me to believe that simply because of the talent of those players that the production necessary will come easily. So where does that put Kirby Smart? Smart can stay at Alabama. He can hope that when Saban eventually leaves or retires that he will be the next in line. The talent is there and it would be a much easier adjustment for his family to remain in Tuscaloosa. 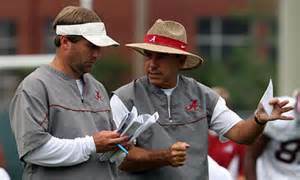 However, would Alabama really promote a coordinator with no experience as a head coach to lead its program? Alabama would be in prime position to hire virtually any coach it wanted. I believe the Crimson Tide would opt for someone who has had immense success at either the NFL or collegiate level as a head coach. Smart could accept a head coaching position at a school like Vanderbilt. This would allow him test his coaching abilities against top competition. If he were to succeed to the level James Franklin (now at Penn State) did, he might be the man for Alabama whenever Saban is no longer there. But, what if he doesn’t succeed at Vanderbilt? The hypothetical outcome of failing to win at a Vanderbilt, after James Franklin had gone 16-4 in his last 20 games, might mean that his stock could plummet. Would taking a position at a smaller school with lower expectations give Smart the chance to grow as a coach? Kirby Smart is in a tough situation. If he stays at Alabama, he runs the risk of becoming a “fall guy” if things don’t go well. The definition of things going well in Tuscaloosa is an undefeated season, so there is little room for error. If Smart leaves he could establish himself as a legitimate head-coaching candidate going forward, however, if he struggles he might ruin the perception that he is great coach. The decision to become a head coach would be reliant on the situation being nearly perfect. He would need a team primed for success, with low expectations, and a desire from its athletic director to play the same style that the Alabama team currently plays. I know that most people look at the salary Smart earns and the success at Alabama and think he should just stay put. However, if you are a competitor (as we believe most coaches are) the goal is to be the head coach not the coordinator. Despite the high salary, Smart is not in charge at Alabama. Most fans even believe that Saban is more in charge of the defense than Smart. If that is true, it makes Smart disposable if the defense struggles again. If I am Smart, I have to take the opportunity to become a head coach soon. I have already let my stock slip after winning consecutive national titles. The time to jump for a new job would have been after winning the BCS title against Notre Dame. Smart could have used the momentum from the title to forge his new path as a head coach. He might’ve been rewarded with a handsome raise and probably given a job that he wasn’t quite ready for (Will Muschamp at Florida is an example). Today, does Smart have the same appeal? Smart needs to prove he can win it all with less next season. The talent will be there but the team will lack experience. Can Smart mentor the young defensive backfield? Will the secondary play better next season despite losing three starters? Time will tell. Until then, Smart is stuck in a tough spot. He is trapped between a stone (the Capstone) and a hard place (Saban’s statue outside the stadium). So the time is now for Kirby Smart to take the Vanderbilt job. Prove your doubters wrong. Smart needs to take charge and lead a program.